Announcement launches fundraising campaign for $9.6 million left in the $46 million project, which is scheduled to break ground in late 2019. Pat Reser, with a $13 million gift through her family foundation, is the lead donor to the Beaverton Center for the Arts that will bear her name. The announcement came Tuesday on the site of the future plaza for the center, which will be north of The Round and City Hall. It is a short walk from The Rise, a 230-unit apartment complex and commercial space that is scheduled for completion next year. Mayor Denny Doyle said all but $9.6 million of the $46 million fundraising goal for the center has been collected — and the rest will be raised prior to breaking ground late next year. Completion is envisioned in March 2021. A multistory 355-car parking garage is planned next to the center. That is a separate project of the Beaverton Urban Redevelopment Agency. "I believe it's time for Beaverton to claim its presence and practice in supporting the arts and creating a space to welcome all forms of music, art, theater and dance," said Lani Faith, the capital campaign manager for the center. Doyle described the identity of the major donor as "one of the worst-kept secrets in Beaverton." "But a lot of folks do not know that for some time, the city had a commitment from an anonymous donor to support the center for the arts," he said. "Today it is my pleasure to confirm what some of you have already guessed." More than 100 people, including Reser family members, attended the announcement. All five of Pat Reser's children attended Beaverton schools, and she has been a Beaverton resident for 55 years. When she came, she said, Beaverton's population was only 14,000; it is more than seven times larger today. Along with her late husband Al — he died in 2010 — Pat Reser has been a major donor to Oregon State University. She was co-chair of the $625 million Campaign for OSU, where they both earned degrees — his in business administration, hers in elementary education — more than 50 years ago. Reser Stadium on the Corvallis campus bears their name. Reser's Fine Foods, now in its third generation, is based in Beaverton and makes fresh and prepared refrigerated food products. It employs 3,000 people. 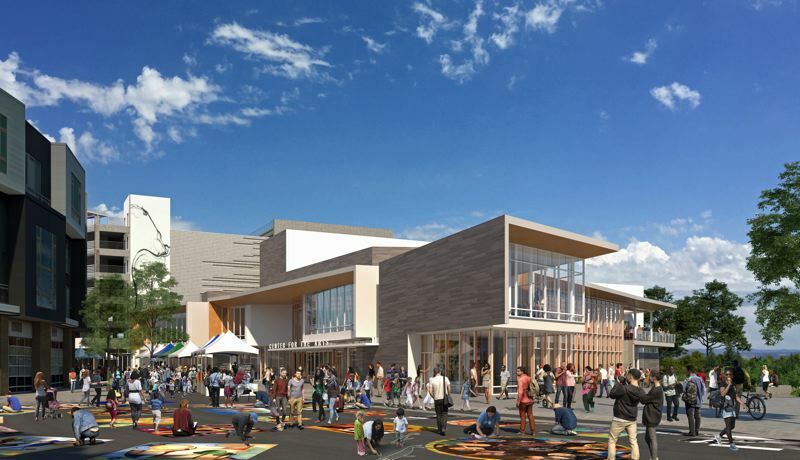 Planned for the Beaverton center are a 550-seat theater, a lobby and art gallery, meeting and conference space, and studios for arts instruction and dance. It is being designed by Opsis Architecture of Portland. "This is not a theater that is going to be used only on Saturday night," Doyle said later. He also said the Beaverton Arts Foundation will help those who might be unable financially to participate in activities. Pat Reser also chairs the Beaverton Arts Foundation, which has joined with the city in the project. "For the past two years, I have chosen to remain anonymous regarding the gift to this project, but all the while continuing to act on its behalf," she said at the announcement. "However, I have reached that juncture where my voice must reflect the courage of my convictions," she said. "So I applaud the courage of Beaverton's elected officials, the leadership who sees the richness that a center for the arts can offer this community and are in support of this project." Doyle said the city loaned $1.5 million to get the project started, but no money from the city general fund will be spent on the center itself. The city contribution will come from a revenue bond repaid from lodging taxes. "We have a professional team in place to raise the money," Doyle said afterward. "All indications are that it really will happen. We've done a lot of homework. It isn't as if we just woke up one day and said let's go raise money." Among the donors in the pre-public phase of fundraising was Jordan Schnitzer, whose own family donated to the renovation of what is today the Arlene Schnitzer Concert Hall in Portland, named after his mother. That 1984 project was the most recent arts center in the Portland metro area. Schnitzer said afterward that Reser let him know early she would be the lead donor to the Beaverton center — and as Washington County's population grows, it was Beaverton's turn to get such a facility. "It was important for other donors to support donors who made lead gifts, so they do not feel they are alone," he said of the $1 million donated through the Harold and Arlene Schnitzer CARE Foundation. "As Portland has expanded and traffic has gotten worse, we have become more neighborhood-centric — and Beaverton, now a major city in this state, needed to have a beacon of cultural life. Now the Pat Reser Center is that beacon… where you can showcase some of the best in the region and nation." He joked that someday, people may refer to the "Pat" much the same way as the "Schnitz" has been for three decades. "What is amazing is that we have two matriarchs of the community who, with their late husbands built the community — and are now giving back so that tens of thousands can benefit from those entrepreneurial early days," he said. Julianne Johnson-Weiss, who teaches music at the Sylvania campus of Portland Community College, closed the program with "One Moment in Time," originally performed by Whitney Houston and produced for the 1988 Summer Olympics in Seoul, South Korea. She was accompanied by four members of the jazz band at the Arts & Communication Magnet Academy in Beaverton. NOTE: Adds comments from Beaverton Mayor Denny Doyle, Jordan Schnitzer, Lani Faith.